Juan Mayer wasn’t always one of the most celebrated aerial photographers in the sky. 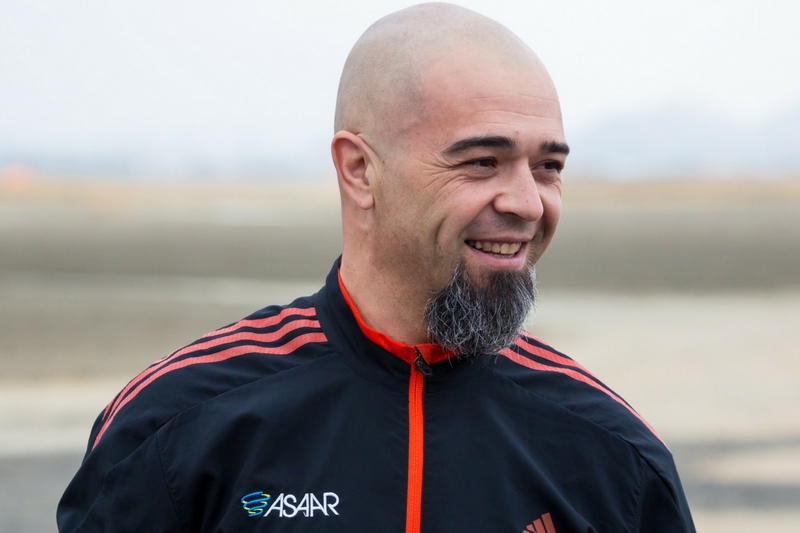 In fact, it’s safe to say he was a late bloomer: he didn’t even get his skydiving license until he’d served in the Argentine Army for 15 years. That said: If time wasn’t on his side, luck was. One day, Juan’s superior officer invited him to do a military skydiving course, and Juan couldn’t think of a reason why not. Norman Kent’s book, of course–titled Norman Kent Photos and released in 1993–was the first of its kind. For the first time in history, the book presented skydiving solely on the merits of its beauty, and Norman presented his subjects as art. The book had a profound affect on Juan–himself a keen photographer. He didn’t let that stop him. 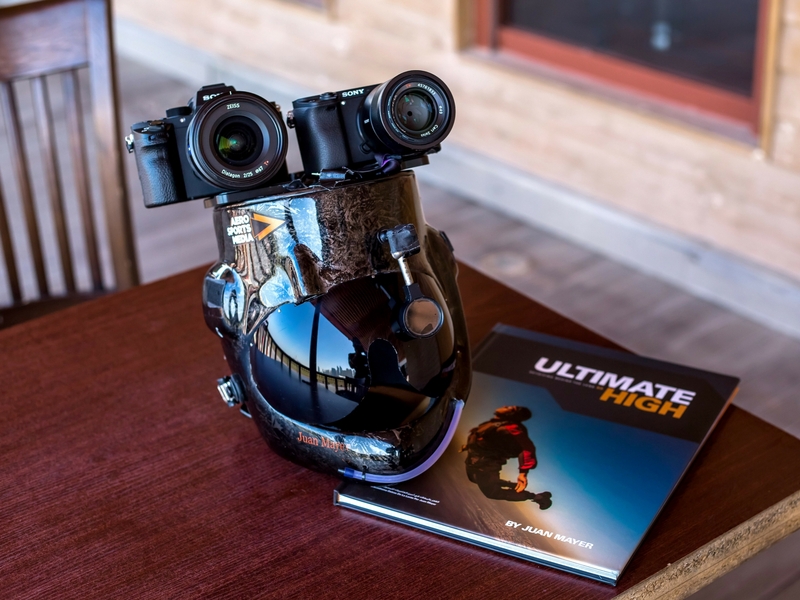 Juan borrowed money to buy a video camera–a Sony PC1–and installed it on his helmet. 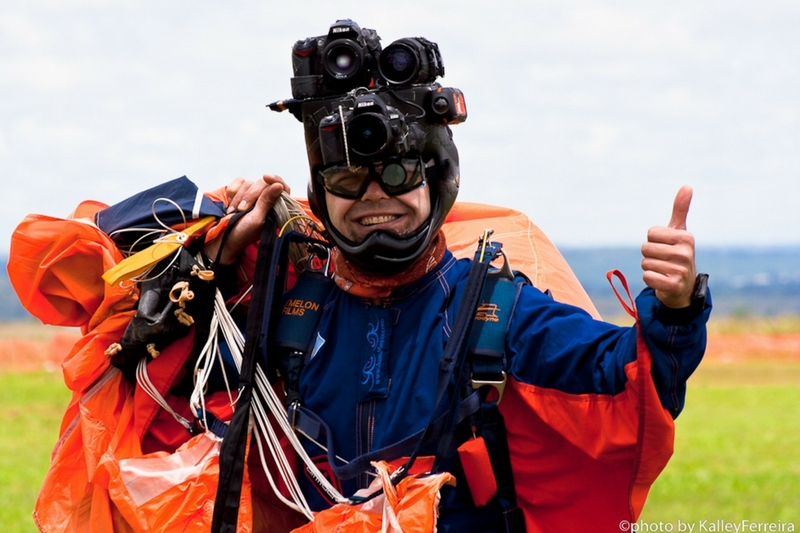 He started offering videos to other skydivers, accepting whatever they could pay. Juan’s rise as an aerial photo/videographer was a very slow one. 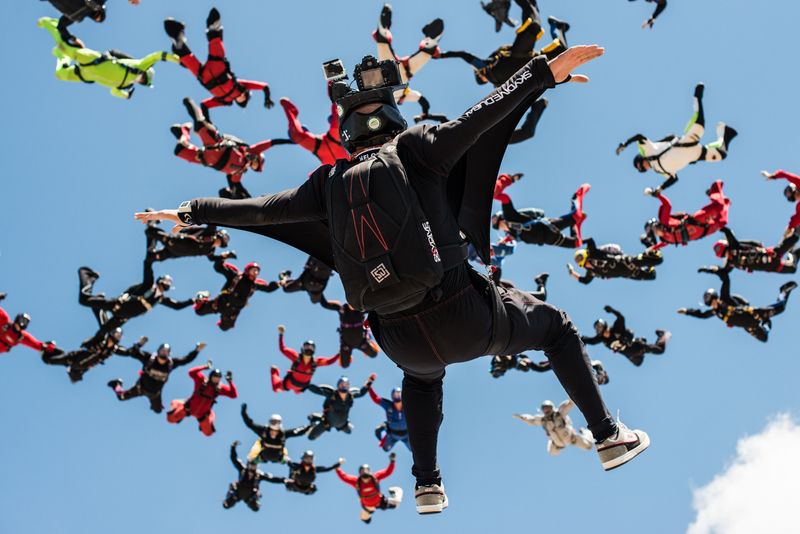 Before YouTube and Facebook, skydivers with that predilection only got work through a much more in-person version of word-of-mouth–and Juan was still in Argentina, in a community of jumpers comparatively tiny to that of Europe and America. “I took a year holiday without salary in the Army and I was full-time skydiving seeing if I could survive as a skydiver. After about two years of weekend-only skydiving in Argentina (and photographing “incredibly boring” weddings to try to make ends meet), Juan realized he’d have to make a big move. As Juan travelled and grew as an athlete and an artist, he began to set himself apart in one vital way: his approach to the shot. Most skydiving photographers then–as now–tended to emphasize body flight over cinematographic virtuosity. They’d fly their faces off, but use the auto settings on the camera to capture the image. Juan approached the subject very differently. It’s rewarding, too. In just a few years, Juan had become one of the biggest names in the sport, earning dozens of major publications a year as well as a full schedule of print, stunt and commercial work. 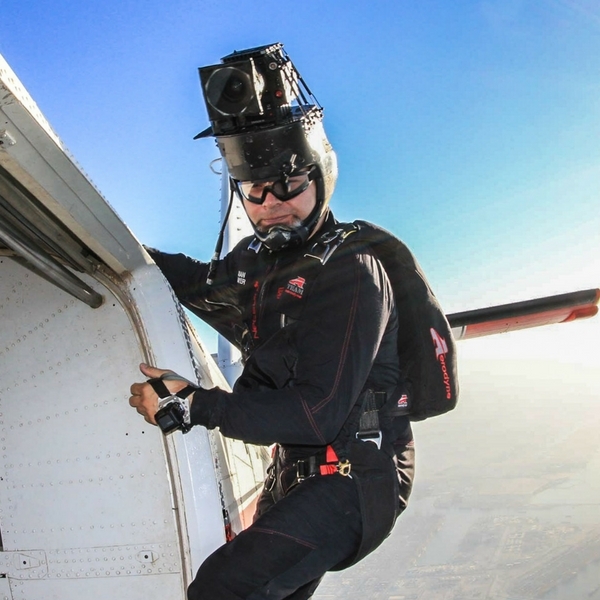 Dozens of dropzones and thousands of photos later–highly acclaimed and published in every format and venue you can think of–Juan was ready to follow in the footsteps of the work that inspired his initial foray into the sport. He set about tackling the challenge of publishing his own book of photos, adding to the canon Norman Kent so memorably started back in 1993. He succeeded. 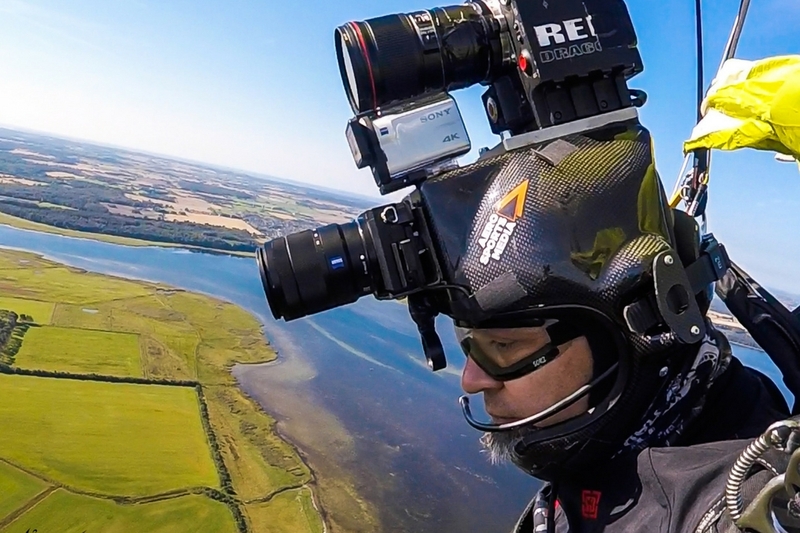 Juan celebrated the publication of Ultimate High: Skydiving Behind the Lens in 2015. That daughter–Kira, now five years old–is the cheerful little center of Juan’s life. She is living in Denmark now, and Juan flies out to see her every month. …Which brings us to the day that CYPRES made sure that Kira still had a dad. This part of the story starts with the first, best advice that eager young skydiving photographers receive about safety in their chosen discipline. “The most common mistake new skydivers make is putting cameras on their helmets before they have enough experience,” Juan begins. “Photography is a huge distraction. When that advice comes from Juan, it comes extra-enthusiastically, because he knows what he’s talking about. Firsthand. And he wasn’t even a newbie. It was only this summer that Juan experienced his first CYPRES fire in seventeen years of jumping. It happened during the course of filming a challenging, high-stress television commercial. Juan was jumping a new helmet, wearing a very heavy RED camera with a very heavy lens to match. He’d taken out his audible when he was engineering a safe means of mounting the camera, and he’d forgotten to put it back in. CYPRES is proud to support Juan Mayer and his jaw-dropping, high-flying artistry. To learn more about Juan–and his amazing book–visit juanmayer.com.